It's Spring Break!!!! (If you're a 7 year old, that is). This means that are somewhat, kinda, almost, tuned morning schedule was turned upside down because camp has replaced heading off to the school bus. The result: we had extra time this morning to kill, but didn't want to start a huge activity. 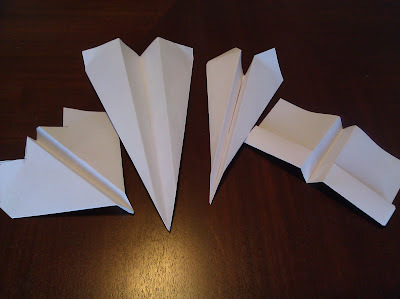 The first four planes offered the right level of difficulty to create. Just enough folding (and one even required some trimming with a scissors) to be interesting, but not so much work that it was beyond what I or a 7 year old could follow. The animated GIFs presented to help with the instructions, worked well. If all goes well, we'll color them, add some stickers and we'll be on our way to an in-house air force.